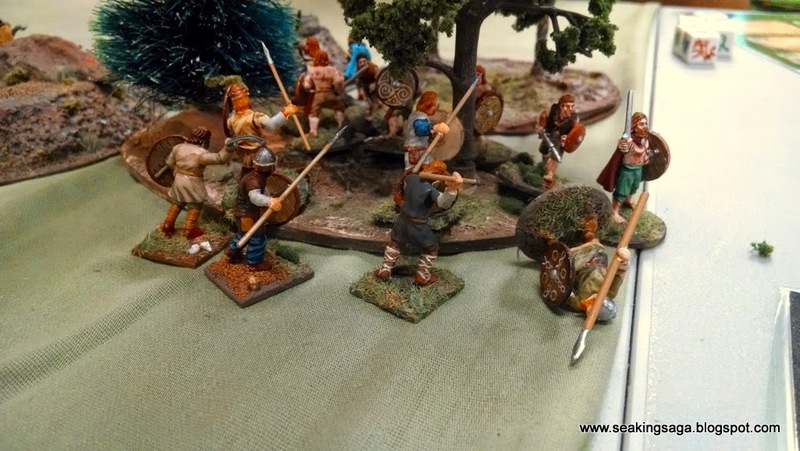 At this weekend's SAGA game we decided to put the Norse Gaels against the Irish, especially with this year being the millennial anniversary of the Battle of Clontarf. 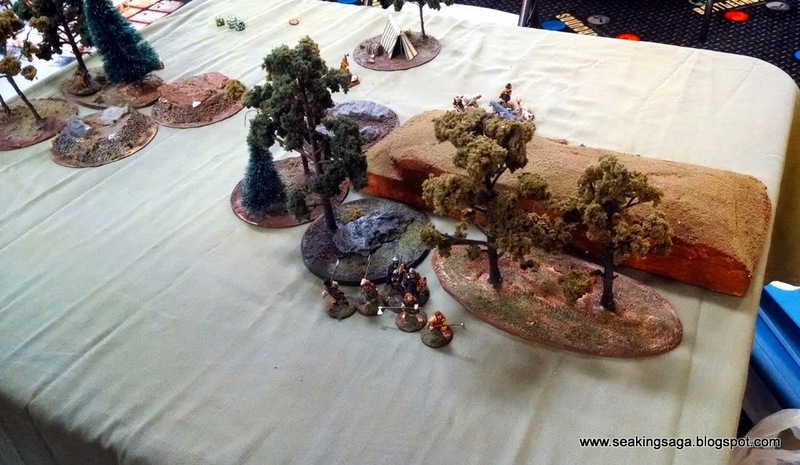 The scenario was called "To the Green Fields Beyond," a custom "hold the pass" variation from the Studio Tomahawk forum. The pass between the hills and rocks is open ground, but impassable for 6" on both sides. Beyond that, the hills and trees are considered rough going. The faction that gets the most figures (counted by victory points) on the other side of the board after eight turns wins. Here's the board after deployment. On the left the Irish have a unit of war dogs, six Fianna with Dane axes, two Curaidh, the warlord and a unit of eight warriors. On the right, beginning closest to the camera, my Norse Gaels are fielding the warlord, four hearthguard with Dane axes, twelve slaves with javelins, four Vikings and unit of eight warriors. and three Irish fianna are gone. If the slave levy does nothing else this game, they have already done more than enough. Fortunately there is more fight still left in them. Meanwhile on the left, my Norse jarl climbs the hill with his bodyguard, and the Irish leave their wardogs on the other side to await his arrival. 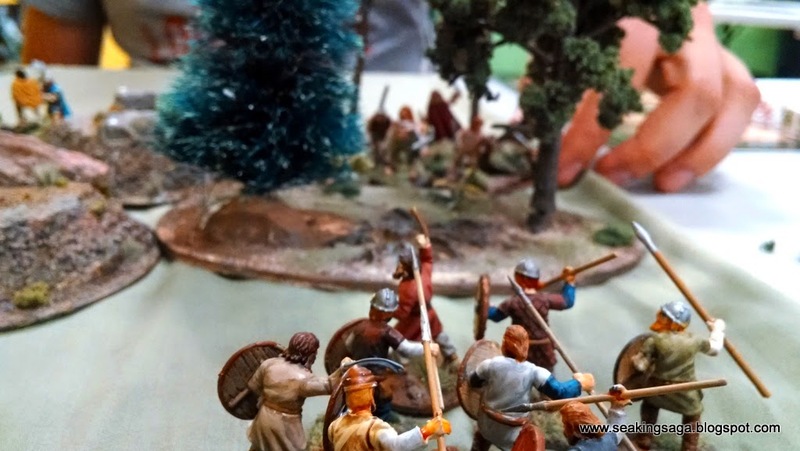 On the Norse Gael right flank, the warriors are moving to press through the trees, but the Irish beat them there, and pepper them with javelins, doing some damage. I approach their warriors with reduced numbers, but with a successful Challenge followed by Ostmen's Fury, I should be able to overcome these Irish. 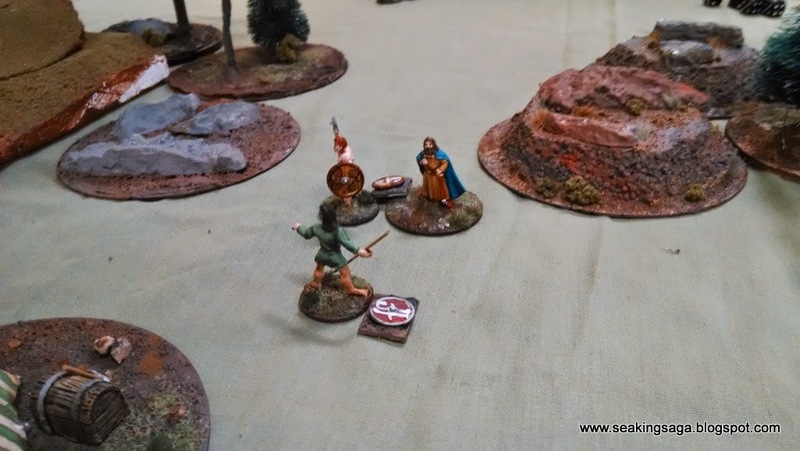 Unfortunately, despite rolling more dice than the Irish champion, the Norse champion falls. It is a pattern that will be repeated. 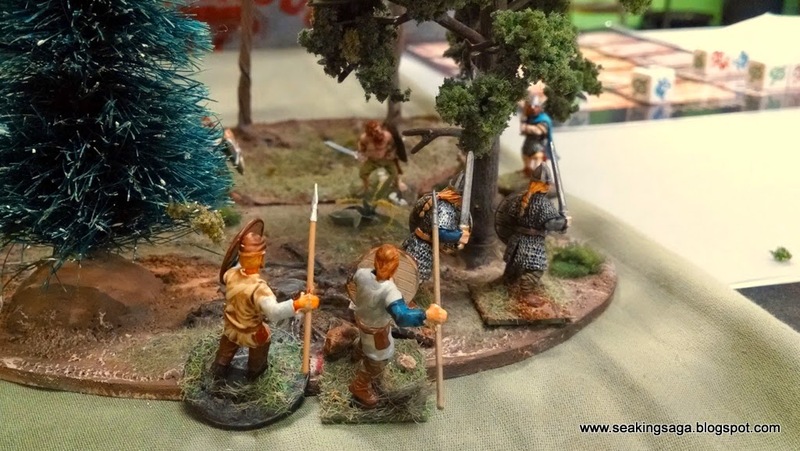 Then, the four Viking hearthguard move in, and surely this challenge will be won...Again, no and another Viking goes down in the subsequent combat. On the other hand, all of my luck must have been going to the slave levy, because these guys manage to take out all six hearthguard, with one of them even surviving combat with a curaidah. As fortunate as the levy were, my opponent decided to move the dogs across the table to take out the last survivor. Meanwhile, the turn counter is drawing close to the end. 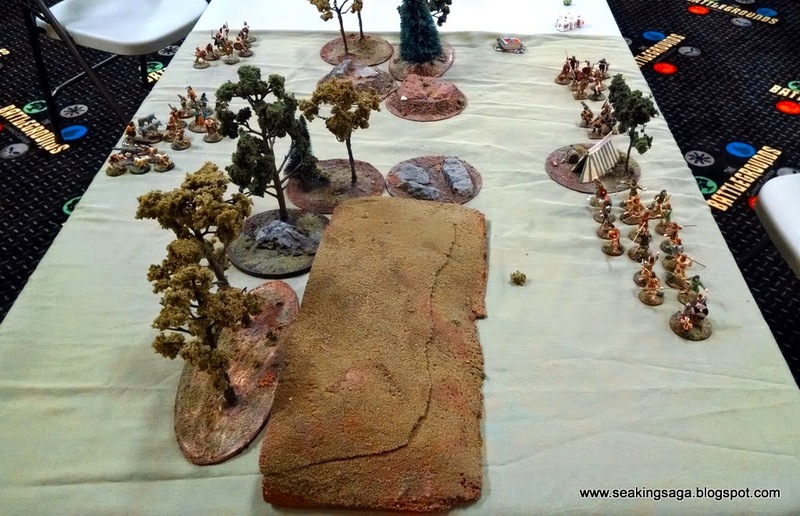 Fortunately for me that meant my Warlord was able to cross the treeline uncontested. 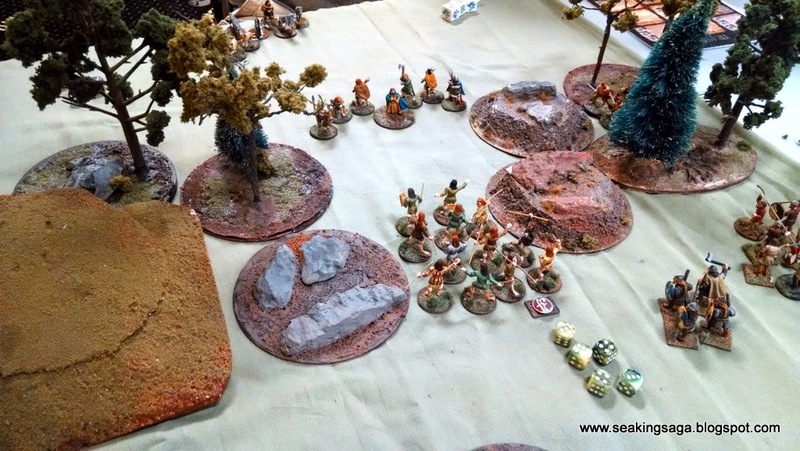 For the Irish to win, their player needed to take out both remaining Vikings on the right with a single of warrior and make it back through the trees. He killed one, but failed to cross to the other side in time. Final victory points: Norse Gaels 8, Irish 7 1/2. 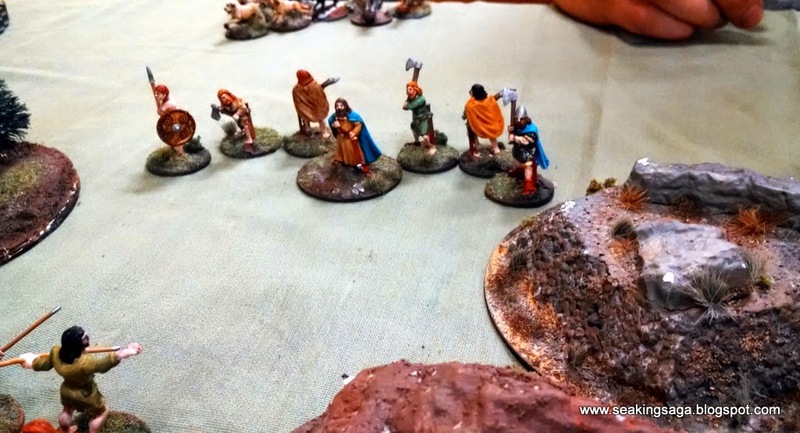 With a Viking army, you have the option (with some figure variations) of running them as traditional Vikings, Jomsvikings or Norse Gaels. I like the offensive power of the Vikings, but find the Jomsvikings too limited, perhaps requiring too much of a long game to build their rage. I want to like the Norse Gaels but, I have to say I am disappointed. All five of my challenges failed and on three of them I was rolling more dice than my opponent. 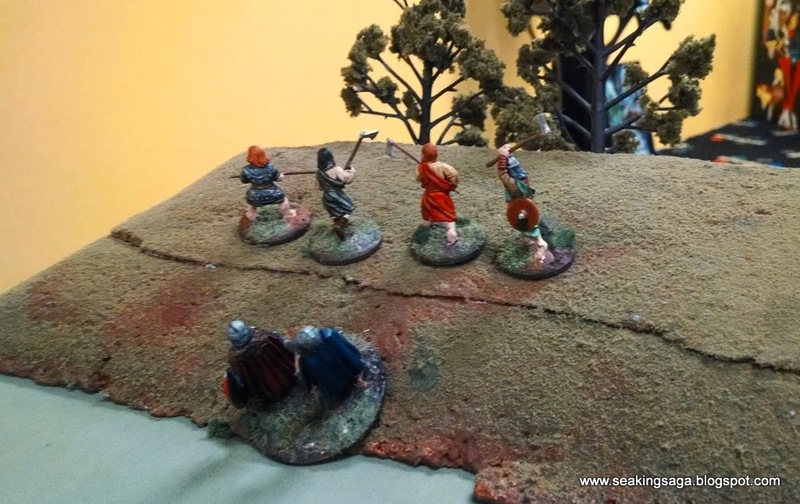 My most useful unit turned out to be the Levy and that is without the Norse Gaels having a single shooting ability on on the battle board. If you're on good terms with the dice gods, this may be your faction; I think I will stick with their more predictable Viking cousins. And as always your after action reports are great fun to read. It looks like you had a grand time, sorry I missed it. 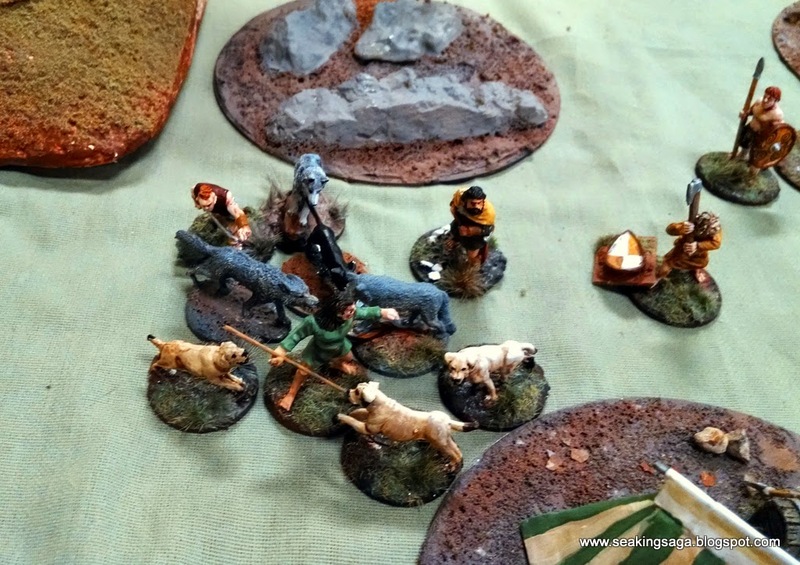 It was a great game, I should have left the hounds to deal with the Norse in the woods. The Irish are a great list.